While rice is cooking, heat oil in large nonstick skillet over medium heat until hot. Add zucchini and onion; cook and stir 3 to 5 minutes or until crisp-tender. Stir in basil, salt and pepper. 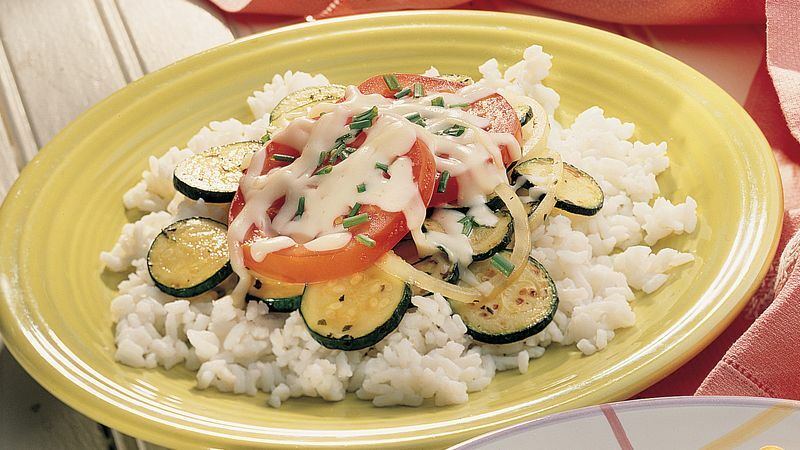 Layer tomatoes over zucchini and onion; sprinkle cheese over top. Cook over medium heat about 3 minutes or until cheese is melted. Sprinkle with chives. Serve over rice. Use a food processor to slice the zucchini and onion, and to shred the cheese. Eight ounces of cooked angel hair pasta is a good substitute for the hot cooked rice.